Like the many up and comers that embodied the NWOBHM movement in the late '70s, Blitzkrieg did as their name suggests with the release of their classic Blitzkrieg/Buried Alive single on Neat Records in 1980, pummeling the masses with their pure metal delivery; a year later they went the way of many peers by disbanding. For Blitzkrieg, and main man Brian Ross, performing carried on in other projects as with the little known Avenger, and Satan, which produced the underground classic, Court In The Act. Blitzkrieg returned to release '85s Time Of Changes before disappearing into obscurity, only to resurface vicariously on those occasions when Metallica threw out a B-side or cover -- interesting to note Metallica covered "Blitzkrieg" on their latest "St. Anger" tour! 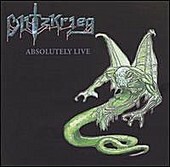 Blitzkrieg, the band, resurfaced in the '90s with a vengeful if varied attack that saw the release of a ten year anniversary album, the underappreciated Unholy Trinity, and The Mists Of Avalon, albums that added a wider scope of sound to their previously primeval style, akin to bands like Skyclad or later versions of Riot. The band, led again by Ross, re-emerged in early 2000 to begin production and pre-press for a fitting return to form entitled Absolute Power, a loosely thematic album built on pride and plenty of amplitude. Bordering the fine line between Power Metal and Thrash, this was a true return to form that saw the band achieve the critical acclaim that had long eluded them, and likely placed them back within the field of players in the metal community no matter the stop and go route they took to get there. Absolutely Live is Blitzkrieg's first full live album, and finds the band in fine form, welcoming new guitarist Ken Johnson, who's string bending, stretching and slashing are of serial killer caliber, and as a whole, they're afforded an opportunity to give the fans a taste of what the latest lineup -- and there've been many -- are capable of. A well drawn cast of veterans and flashy newcomers, Blitzkrieg's likely at the apex of their careers and seem primed to ride their latest resurgence for all its worth. The live record is a culmination of preparatory shows for Germany's popular -- aren't they all -- "Headbangers Open Air Festival" and features 17 cuts drawn from their replenished well. Gray-bearded classics as the lengthy opener "Ragnarok," follow up "Inferno," and "Armageddon," stand uniformly with modern day successors as "The Wraith," "Soul Stealer," the anthemic "We'll Rock Forever," and "Metalizer," -- not that followers might notice a discernable difference either in style or title though there does exists a deeper, darker guitar sound; a welcome attribute to the forbearers of true metal music and modern aggression. "Absolute Power" was constructed to be everything Blitzkrieg should have been when they began, and even if it took them 20 years to get there, it's granted them the reprieve they needed to bang a dent in the odd Euro Fest or local club gathering. How Saxon managed the re-emerge after the ridiculousness of "Rock The Nations" and the eight or ten years that followed is anyone's guess, but the fact is, much consolation should be found in their longevity and continued popularity. Absolutely Live proves Blitzkrieg can still give the fans what they want, much of which includes the very early, and mostly new material, opting to steer clear of much of the tumultuous middle '90s stuff, though "Unholy Trinity" is a welcome, if short burst. The sound is pure garage, yet the production is surprisingly state of the art, and mixed to post-poverty level listening standards. The packaging, however, endearing though it is, leaves a few holes to be filled in both song sequence and track listing, but does include current day performance photos and quick quip from band founder Ross. Blitzkrieg is back and building steadily from "Absolute Power" and beyond, presented with a never say die attitude that's continued to pack remote rural locations worldwide with tens of thousands of screaming masses of metal heads!